Cast Magnesium alloy. Single seater race wheel. 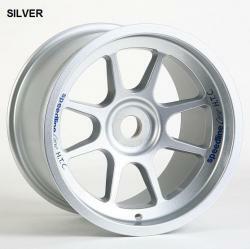 Manufactured using Speedline's unique HTC magnesium casting technology, this wheel has become the first choice for many Formula 3 teams. This wheel can be seen on many Dallara, Lola and Mygale chassis around the world. Specific design features ensure the wheel is very stiff, whilst remaining light weight and durable.